A make-ahead holiday cocktail recipe for tequila punch. It takes just minutes to make and features reposado tequila and homemade pear brandy (recipe included). Thank you Patrón for sponsoring this post. 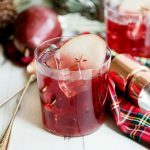 Tequila may not be the first thing that comes to mind when you think about holiday cocktails, but I have a festive tequila punch recipe for you that is going to change that! This tequila punch recipe is just a little spicy, a little sweet and just the right amount of boozy. 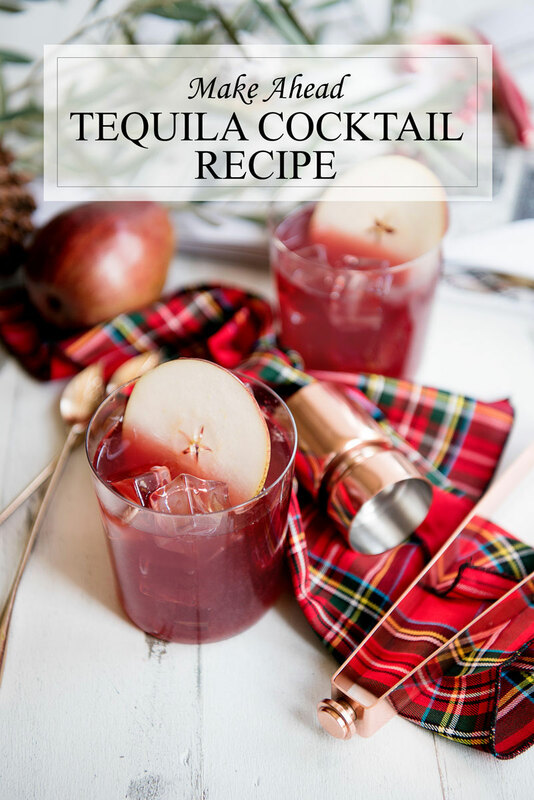 The mixture of pear, red wine and tequila is just…yum! It’s almost like a sangria, but made with tequila. I also love that it’s a vibrant holiday red and packed with fruit. I used Patrón Reposado tequila for the recipe. 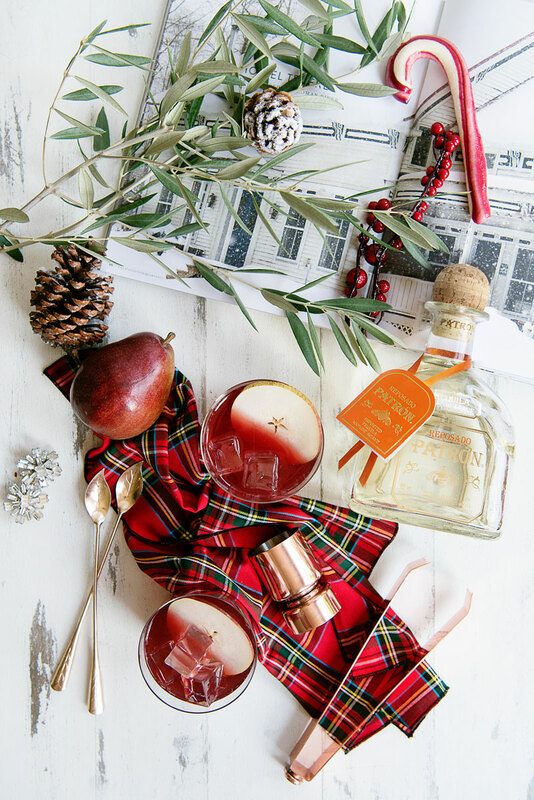 Patrón is a name that represents quality tequila, so trusting them for our holiday entertaining was a no-brainer. Their Reposado tequila aged for at least two months giving it a smooth taste with a subtle oak flavor. It also has some citrus notes which pair perfectly with the orange juice and fresh fruit that are mixed in. 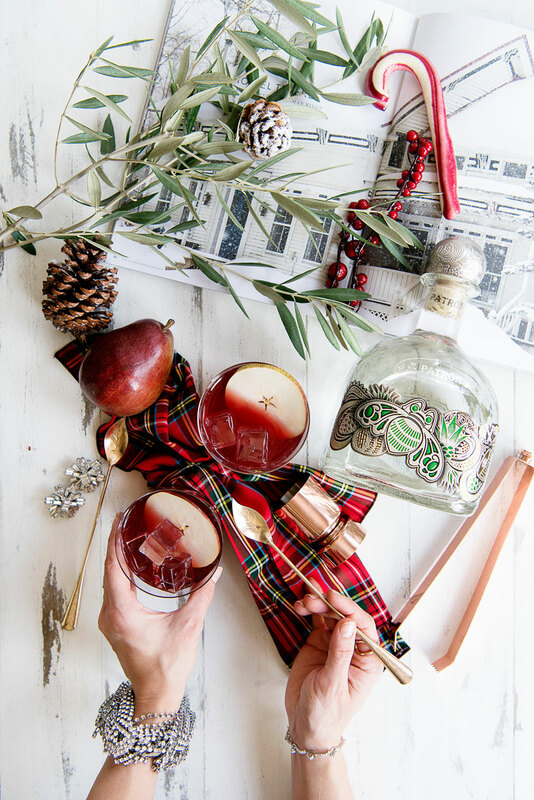 If you’re looking for a great hostess gift for those holiday parties, try a pre-mixed bottle of this tequila punch. Even better, pick up a Limited Edition 1-Liter bottle of Patrón Silver. The bottle features a gorgeous silver design with emerald-green accents and a silver stopper. The designs are a nod to Patrón’s Mexican heritage. The bottle is truly a work of art. It’s a stunning collectible that is only available for the 2017 holiday season. This cocktail recipe is a great holiday party option because it can be made ahead of time. Time is our most precious currency when it comes to holiday entertaining and I never seem to have enough of it. I’m trying to be more organized this year by picking recipes that can be made the day before. When guests start to arrive you can pull it out of the fridge and serve over ice. It’s absolutely ideal. I used oranges, pears and apples, but you can mix it up with whatever you have on hand. Adding seasonal fruit like pomegranates or even a blood orange would be really fun and beautiful. The recipe calls for pear brandy, which is a specialty item that you may require a visit to a liquor store. If you’re planning far enough in advance (at least a week) you may want to consider making your own pear brandy. It’s super fun, only takes a few minutes of active time and will save you money! It also tastes wayyyy better than most of the versions you can buy in a store. If you’re making this recipe last-minute and in a pinch, you can just substitute regular brandy for the pear brandy. For more great tequila recipes for the holidays and beyond, make sure you check out the Patrón recipe lab. A make-ahead holiday cocktail recipe for tequila punch! It takes just minutes to make and features reposado tequila and homemade pear brandy. Original recipe source. Add all ingredients into pitcher or carafe and mix to combine. Pour over ice, garnish with a pear slice and serve. May be made up to a day in advance. *Recipe for homemade pear brandy below. Slice and core one pear. 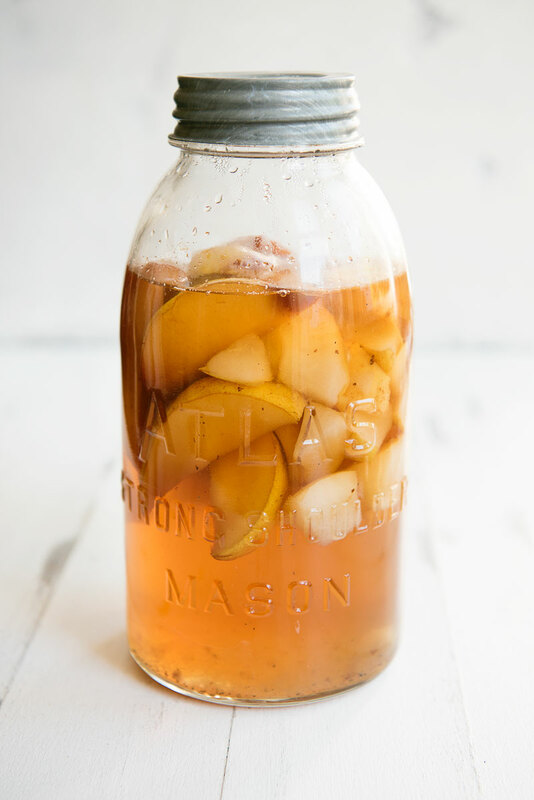 In a large jar, combine the brandy, one pear and vanilla bean. Let sit for three days. Remove vanilla bean and let sit for an additional two days. Core and chop remaining pear. Combine the granulated sugar, water and pear in a medium saucepan. Heat until boiling and let boil for 7 minutes. Reduce to a simmer and let simmer an additional 7 minutes. Add liquid to brandy jar. Let sit for an additional 2 days. Strain liquid through fine mesh strainer and then again through a coffee filter or cheesecloth. Does not need to be refrigerated. Keeps about 2 months. Even if it may not seem like it needs it, straining it through a coffee filter will remove small debris and prolong shelf life. The boozy pears that remain after straining are great on ice cream. 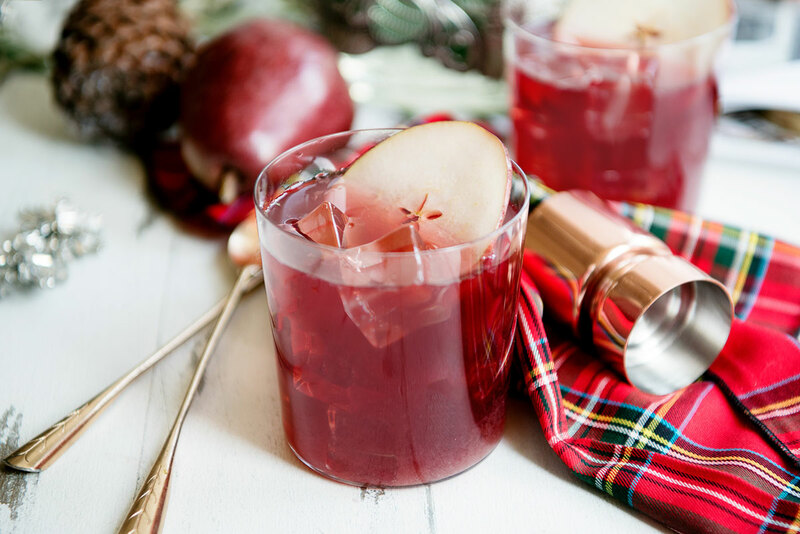 Need a great holiday punch recipe? Pin this cocktail recipe for later! This post is a collaboration with Patrón Tequila. Wondering why I do sponsored posts? Read more here.